It depends on what you are using the eggplant for. Black beauty is good for eggplant parmegiano. 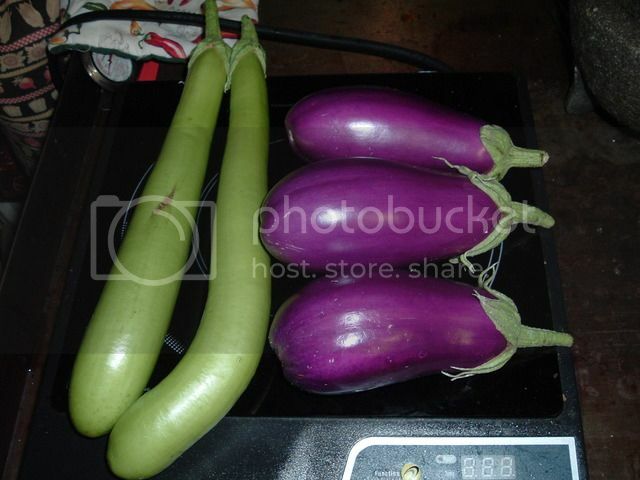 Long Asian eggplant comes in different colors green, purple, striped, light purple and dark purple. Most people like the purple eggplant because they are used to it. They don't like the color green. For myself purple eggplant has a shorter bush life, they are only good when they are young and shiny. Once they get dull and hard they are bitter and the skins can be tough in a young or old one. This is still the most popular type for Asians because we will stew and stir fry them. Eggplants pick up the flavor of whatever sauce they are in so, except for seediness and bitterness and tough or tender skins they are all pretty much the same. I like the green eggplant myself because of the longer bush life. They take longer to get tough on the bush and the skins stay tender even though they get quite large. They are green though so not as appealing a color when cooked but they taste the same otherwise. Pintung long is a good eggplant for stews and stir fries because they are small and skinny which means less cutting and less exposed surface to turn brown and bitter. The smalll petch type thai peppers can be very seedy and more bitter. And the turkey berry is a thorny and very bitter eggplant, but some Asians prefer bitter flavors with fish and in curries. It is an acquired taste. I don't care for them much. Most people here do not like the large round eggplant like black beauty because of the large cut surface area. To keep them from getting bitter you need to either salt them or keep them under water. When I am making pork with eggplant, Evil jungle prince or spicy eggplant, I keep the cut ones under water. They absorb water like a sponge so usually you don't have to add water or much broth to make a gravy with eggplant stir fry or curries. The white eggplant is hard but is very creamy so it is good for stews and curries. Konasu and Dewako are bite sized eggplant sold by Kitazawa seed that can be used in stir fries but I most commonly see it pickled. Two eggplant give me 8 eggplant every 10 days or so. Its a good thing they are easy to give away. Unfortunately my mom has an eggplant tree too that is indestructible and really thorny and I can't pawn any eggplant off on her. Eggplant can becomes a medium sized shrub about 5 ft tall and is a short lived perenial here. My neighbor had one for 8 years. I usually only keep eggplant 2 or three years, but I grow mine in a pot and I replace it when production starts to fall off or the last one was replaced because it was infested with scale and it was already old. My new eggplant is a long purple but I have already cut it back because of mites and it does not look really happy. I may replace it again it does not look like a strong plant and I would rather have a Roleks (Thai long green) anyway. I don't have the extensive experience with eggplants as imafan26 has, and he got me interested in this green variety as well. 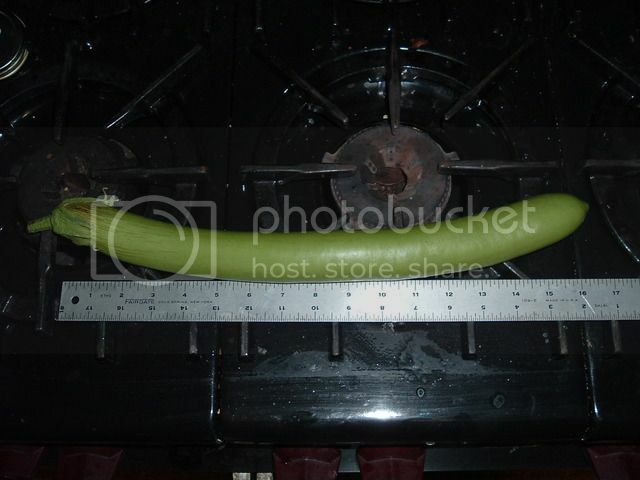 I like the Black Beauty and is the one im currently growing, i mostly make the Baba Ganoush And its a good one for it because of its big size, however i remove most of the skin in the process, if i could find one that aint so bitter skin i might put them whole. They are also really good for the barbeque or oven "grilled" due to its big diameter i think. I havent tried many different kinds tho, the Black Beauty is the one we commonly will find in the stores here. I wanna try this one next year called Wento it has smaller fruits supposed to be very quick and with continious harvest, sounds good for my climate, but will know when i tried. Its from Nepal. A new one I'm growing this year is called Kamo -- a Japanese heirloom from Kitazawaseed. I really liked Hari eggplant last year -- long green with tender thin skin. I saved one to mature yellow stage and saved seeds and am growing them this year. I also have a few eggplants I managed to overwinter in the house after hearing that they are perennial in tropical areas -- I think these are Diamond. Two other varieties didn't make it through the winter, but these are my first successes -- failed twice for the last couple of years, but I'll get the hang of it eventually. When I am making pork with eggplant, Evil jungle prince or spicy eggplant, I keep the cut ones under water. They absorb water like a sponge so usually you don't have to add water or much broth to make a gravy with eggplant stir fry or curries. -- could you post in the Recipes forum? Would you like to share how you overwintered the eggplants? Or have you already? glad to hear you're having successes with Eggplant now. Applestar! We had better luck with mid summer plantings here! I need to get some eggplants! Awesome post there Imafan! Looking forward to seeing some of those recipes! Here is a large, round, flat variety from the kingdom of Cambodia. We collected this variety in 2004, when we were touring this once war torn southeast Asian country. 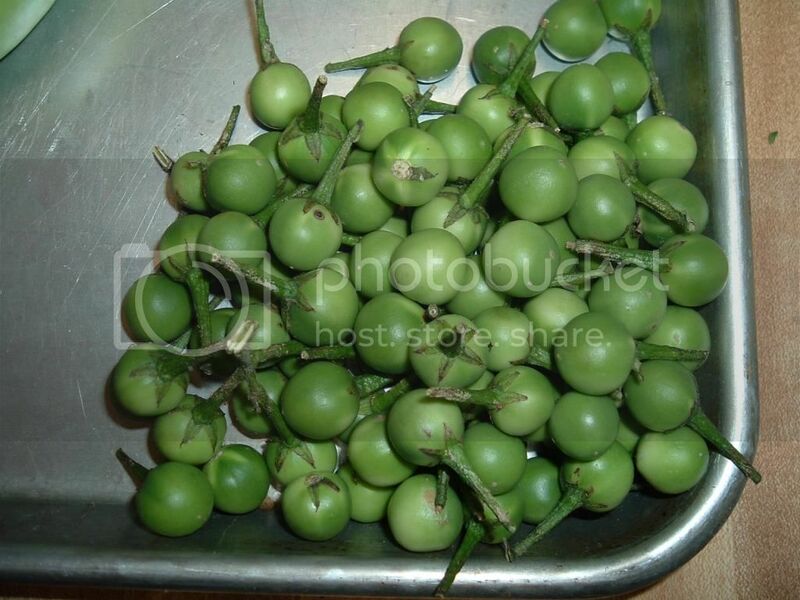 Attractive fruit are pale green with dark green stripes, and are lightly ribbed. This is a very unique color pattern for a large variety. We are proud to be among the first companies to offer varieties from Cambodia, a country with a delicious cuisine that is in danger of being lost. These are great eating, and have a deep, full bodied eggplant flavor. I like Black Beauty-I mainly cook it as Eggplant parmesean or cooked up in rice dressing, I have planted Ichiban, and the green eggplant. Black Beauty is still my favorite. I have grown over 47 varieties of eggplant (that was last year, when somebody asked me how many, and I made a list, from memory, so I know it's more! lol), and Ichiban is one that I have grown since the 80s. It is almost always the earliest, and it is one of the best flavored, IMO. I'm just marveling at all the excellent information you all provide! I grow Hansel and Galine as they do well in my climate. They are both great eggplants. Now that I have more time, I'll post some more info on some of my favorites, as well as others. For flavor, it seems to me that most Asian EPs (the long, skinny ones) are sort of bland, but this isn't a bad thing, as most in most of the dishes I put them in they absorb the flavors, and the eggplant flavor is more or less covered up anyway. 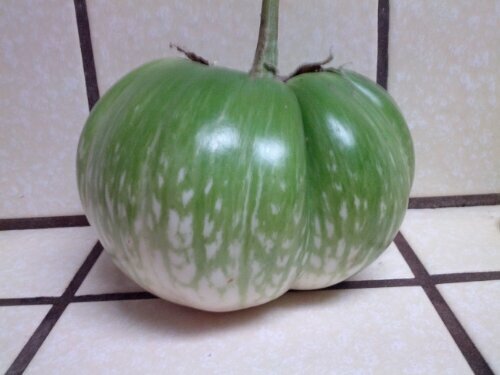 The few white eggplant varieties I have grown were the mildest flavored, and since they really didn't produce that well, I never grew them again. Those Ichibans are one variety that has kept the eggplant flavor, though not as strong as the large varieties, like Black Beauty. And most of the Asian EPs don't get much of a bitter flavor when over-grown- it seems that the ones with the stronger flavor are the ones that become bitter. While I do make a note of the flavor, this is not the main thing I look at when deciding whether to grow a variety again. Most, like tomatoes, drop their blossoms when it gets into the mid-90s and above, and some even sooner. And some are very late, as with peppers. And some simply do not produce! I had one last season that I only got 3 fruits from the entire season! Negra Lisa was a new large variety I grew last season. It was productive, though late, and had a decent eggplant flavor, and no bitterness in the one that I let get a little seedy. If I want a larger EP, I might try this again. I have grown several Thai round EP - Petch, Kermit, and light and dark green. Can't seem to figure these out - the plants simply don't get very large, and produce briefly, then stop, like it's the heat. Yet, how could it be hotter here than in Thailand? lol I have had some other SE Asian varieties that seemed stopped by heat, and this didn't make sense. The flavor of the small rounds is different, but nothing special, and considering how few I get per plant, not worth the bother. I am not at all fond of the Turkish eggplant - Solanum aethiopicum . I grew two types of this species, and both were very bitter when under-ripe (when you pick most EP! ), and got sweet when ripe, but no great flavor, IMO. They were productive, I will say, and ornamental, with all of those orange fruits on them. Eggplant is a loser. Quite sure I will be just fine if I never taste another. Grow something edible such as crookneck squash! Pepperhead, there is gardening at high elevations in Thailand, altho, those tiny eggplants, I'm at a loss in the kitchen as to what to do with them. You may not want to pay much attention to me. In my gardening environment, if I get 3 nice eggplants from the plants, I'm okay with that ... they need to be of some size for eggplant parmesan, however! Long green or purple Asian types are useful and do better for me. Shoya and Roleks do well and have been in my garden for several years. So has Epic. It is a smaller Italian bell and also an early and dependable choice.